This weekend our family went to San Francisco for a quick little getaway. We didn’t have a lot of time there, but it was fun and we had beautiful weather (as you can see in the picture below). The last time our whole family was in San Francisco, I had Jacob in a stroller and Spencer in a front pack, so this was a much different experience. Jason had work to do so the boys and I did some exploring (and a little Christmas shopping) on our own, but first we walked the bridge. 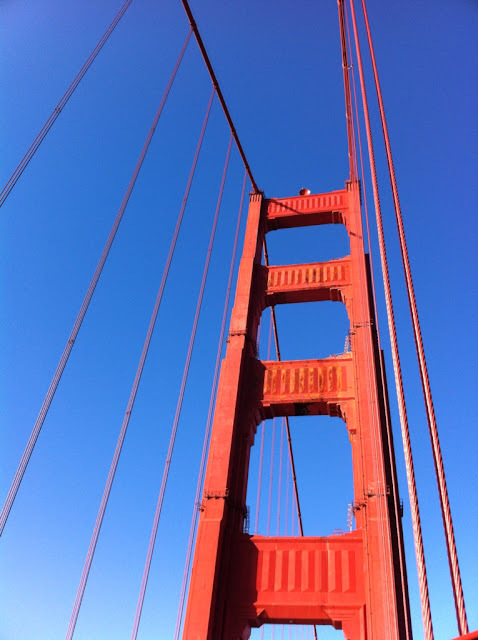 Despite the fact that Spencer couldn’t get over his irritation that the Golden Gate Bridge wasn’t (isn’t) “golden,” the bridge was beautiful with the blue background of the sky. The picture above was taken with my iPhone 4 and I didn’t touch it up or edit it at all- such a pretty fall day! The picture below, however, is obviously altered. I edited it on my iPad using a program called PhotoStudioHD (@fxphotostudio); I applied simple filters to change the original image (picture in the top left of the collage). The filters used were: Original (no filter), Black and White Grained, Color Pencil Sketch, and Atlantic Beach. 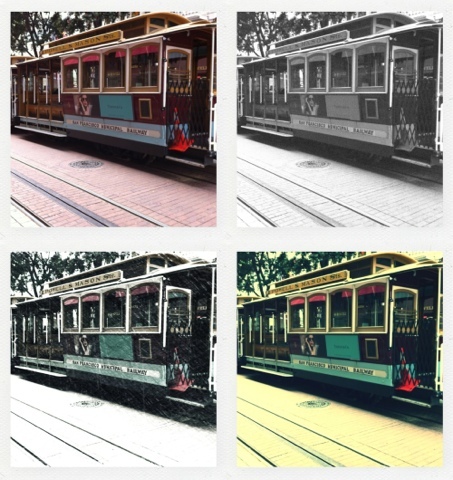 I saved the new images to my photo library then opened them in another app called PopBooth (@popbooth on twitter) that allows me to arrange them either in a 2×2 grid or 1×4 (like you get in an old fashioned photo booth). Both apps are really quick and simple to use for fun results. The highlights of our day were The Cheesecake Factory on the top floor of Macy’s at Union Square and the nighttime ride on the cable car. I would highly recommend both! 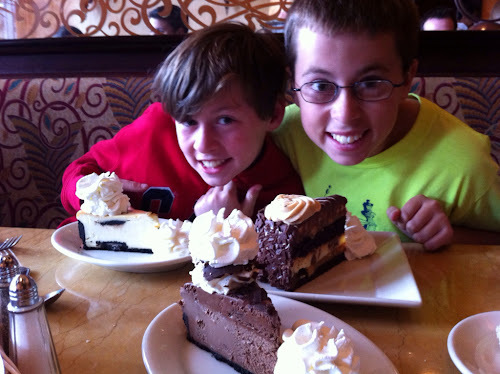 The Cheesecake Factory was amazing- we ordered a cheesecake slice for each of us, which was about twice as much as we could actually eat! Look at the size of those three cheesecakes (Oreo Cookie for Spencer, Peanut Butter Cake for Jacob, and Chocolate Mousse for me)! We loved them all and will definitely go back again; maybe next time we’ll share one piece…probably not, though. The Cable Cars are a typical touristy, must-do experience for San Francisco, but at a friend’s recommendation, we rode them at night and that really took it up a notch. It wasn’t nearly as crowded, there were beautiful lights, and it just felt more special somehow. 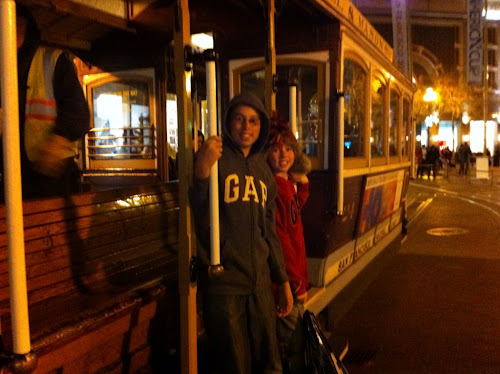 The boys and I rode from Union Square down to the Wharf, then hung out in a coffee shop and enjoyed warm drinks and wifi for a bit before riding the trolley back to Union Square. It was just a nice evening. We also got to play some with Jason… bouncing away at the House of Air (@houseofair). The House of Air is a large warehouse/hangar that has been converted to an indoor trampoline park. There is no good way to describe it, so I’ll let the pictures and videos do the work. 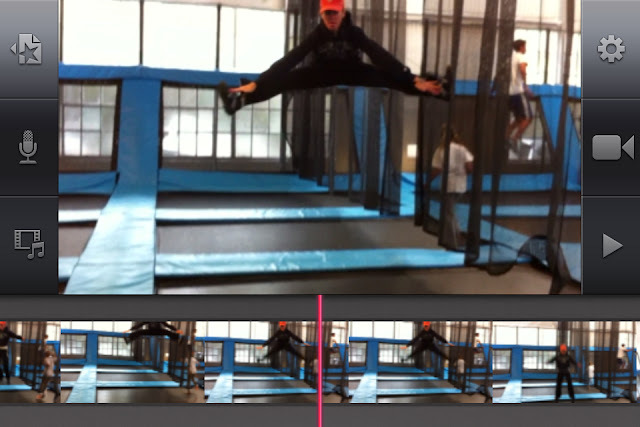 This first picture is just a screenshot of the video from my iPad (in iMovie). You can see that I stopped the action when I was up in the air. I’m pretty pleased with this picture because I never knew I could do that! My shoulders were pretty sore afterwards! I added a video below of Jason doing a forward flip (missed the video of the backward flip he mastered while we were there! ), but I still need to edit the video of the boys; then I will post those videos too. You can kind of see in those videos what the House of Air looks like and how it works. It’s a little chaotic at first, but they did have “adult swim” time when the kids were only allowed in one section and the adults got to play on the other. That was nice because then you didn’t have to worry about landing on a six year old who happened to cross under you when you were up in the air… something to avoid. So, if you’re in the Bay Area and looking to get a little exercise, check out the House of Air. 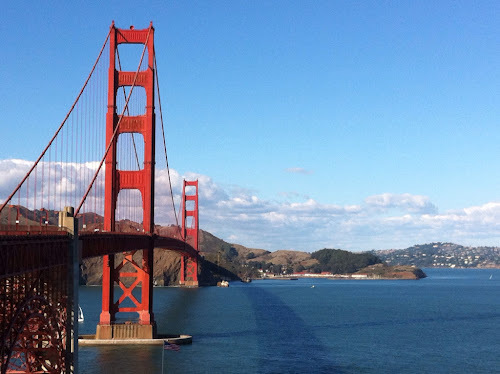 One last thing… San Francisco was a much easier, quick getaway than I expected. From our house to our hotel in downtown (right across from Union Square) it took less than six hours including stops. I still prefer Portland, but we had a good time and it’s nice to have options.